Want to know which amethyst facts are worth remembering? We’ve got you covered. Amethyst is a variety of quartz (SiO2) that gets its violet hue from the presence of iron and other trace elements. Its regal coloring makes amethyst minerals the most prized gemstone in the quartz family. Other quartz varieties include Citrine, Rose Quartz, and Praisioilte. Mined: Brazil, Uruguay, Sri Lanka, Siberia, Canada, India, Bolivia, Argentina, and some African countries. Care: Store out of direct sunlight. Clean your Amethyst with warm, soapy water and a soft bristle brush. Keep away from strong chemicals and avoid sudden temperature changes. Metaphysical Properties: Amethyst is a calming stone and has long been thought to help overcome addiction and protect against drunkenness. Wearing Amethyst is said to heighten chastity, sobriety, and the ability to control one’s thoughts. Healers have coveted this stone for its capabilities, evoking energies of stability, peace, calm, balance, courage and inner strength. It has been used as an alternative source for aiding hearing disorders, insomnia, headaches and problems with the heart or lungs. Amethyst has been used to help align the chakras throughout the body. 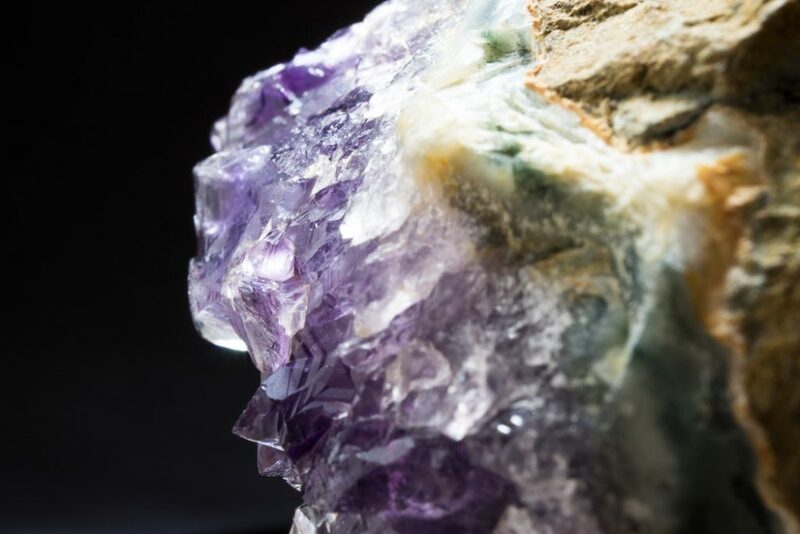 History: Documented use of amethyst in jewelry dates back as early as the Ancient Egyptians. Egyptian warriors were said to wear amethyst during a battle to remain calm. 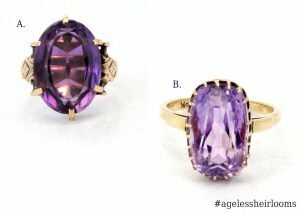 Amethyst, a symbol of celibacy, is also known as the “Bishop’s stone” and was incorporated in church jewelry in the Middle Ages and beyond. The crystal has also been used in Royal jewelry throughout history, primarily because of its color. Purple was a color of luxury, and the violet dye for clothing was expensive, so it was reserved for the wealthy; the matching amethyst crest jewelry followed suit. The American National Association of Jewelers added Amethyst as the birthstone of February in 1912. It has also been attributed to the Zodiac sign, Pisces. Folklore: The term amethyst comes from the Greek “amethystos” meaning “not drunk.” It is believed that the term originated in Greek mythology. As the story does, Dionysus, the god of intoxication and wine, was pursuing a maiden named Amethystos. The maiden adamantly refused his affections. In response to these unwanted advances, Amethystos prayed to the gods to remain chaste. The goddess Artemis answered and transformed her into a white stone. Humbled by Amethystos’s desire to stay chaste, Dionysus poured wine over the stone as an offering, dyeing the crystals purple. Thus the mineral amethyst was born.